I purchased this for my holistic wellness center. It's perfect! It's good quality in that it has some weight to it. The coloring makes it almost appear like carved wood, although it's resin. Very happy with it! 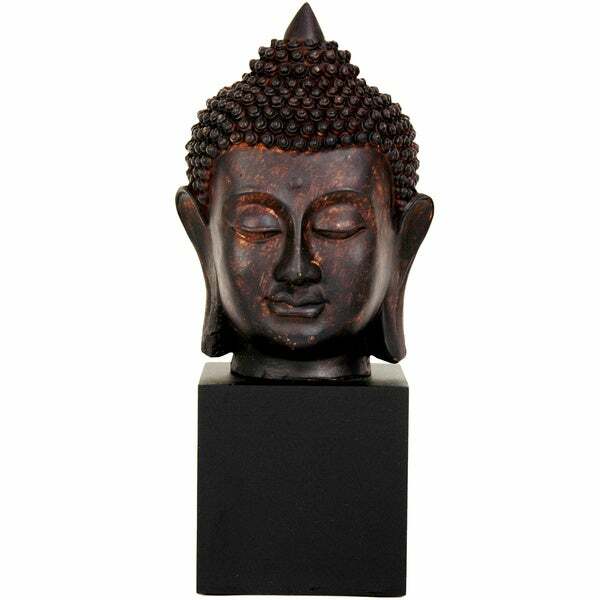 Beautifully handcrafted, this Thai Buddha statue comes complete with a faux antique bronze patina finish. This Buddha head statue has all of the correct facial proportions to look just like the original. This handcrafted item and many others come from a third generation family run workshop in mainland China. Their skills of hand-painting, hand-rubbed lacquering and hand-tooling have been passed down for many generations. We are proud to support them in their quest to keep their age-old techniques alive for future generations. Many of the artists are hired out of semi-retirement to work from home training the next generation to become master craftsmen. These masters are highly respected in their craft and their culture which have survived through many Chinese dynasties and continue to produce valuable and desirable pieces for your home decor. I've found over the past 5 or 6 years that a few touches of Asian art here and there have a very relaxing effect on me. I have another Buddha head statue, but it's one that has a peg between the head and the base. My son gets a bit creeped out looking at it, saying it reminds him of the kids in the old book Lord of the Flies. He'd say, "Mom - really - a head on a stick?" Ever since that's what comes to mind, so when I saw this one at Overstock, I had to have it. I've relegated the other to my bedroom on the corner of the dresser and for some reason it looks better there. This one has a place of honor on a shelf in the living room and I really do love it. The color of the finish is very pleasant - it sits next to a bonsai plant and seems very at home there and the size is perfect - doesn't overwhelm. So glad I found it. Awesome, Beautiful Statue, Good Quality, it looks good in my living room. This is a beautiful Buddha head with a great "feel' to it. Not as large of scale as I thought, however well made. Love this Buddha head! Only wish it was bigger. It was smaller than I expected, but still lovely. This is just what I was looking for. Looks great and has a lot more detail to it than I originally thought. Well worth the purchase. Very pleased with this Buddha. Had stopped by a few shops here in NYC and priced comparable items that were priced at $100 more!!! Got nice compliments as soon as I took it out of the box. Super fast delivery! The statue is just what I've been looking for. The design and finish are very appealing and give it an elegant and serene quality. Unfortunately, it was damaged, presumedly in shipping, so that the head arrived detached from the base. The pieces can be glued back together but I first have to remove the large clump of dried glue that stayed on the base. That part was disappointing but not worth returning it. I really like this piece, &amp; it was reasonably priced. Considering it was a bigger piece than what I thought I'd be getting. Very happy with this purchase. ‘This is such a nice, strong depiction of Buddha. For the price I should have gotten a set. It’s very study. I added a Bindi on her forehead. Beautiful piece. Lovely detail, great size for and weight. "how do i get this sent to my son in california"
Hello terrysbrat, when you are checking out, you will need to put the shipping address as your sons address in California. If you have further trouble with this process, please reach out to our customer care at 1-800-843-2446 for assistance. Have a great day! I hope it looks nice and is not cheaply made. "Is the stand included in the dimensions or are those measurements only for the head itself?" Thank you for shopping with us rxmaye. The 10 inches includes the base. Have a great day. "Can this be placed outside? How much does it weight?" The shipping weight is 9 pounds. The recommendation is to keep it in doors.